We have made Academy for Creativity even better – and we’re now ready to announce the release of a new software update. The release of version 2.0 includes two major modifications: 1) we have optimised the student results page for teachers with a bunch of new features, and 2) we have made it possible to get a certificate of achievements after ten hours of training. 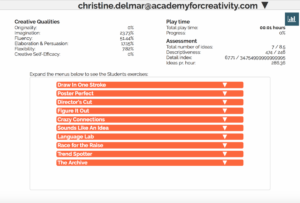 We have worked hard to improve the overview for teachers, relieving teachers in the assessment of students during Academy for Creativity courses. Teachers can now view a histogram outlining each student’s training sessions, to track their specific training times. This comes in handy to see whether the students are training 15 minutes per day each week (as recommended) or 1h45m every Sunday night. Furthermore, teachers can now quickly get an overview of the number of ideas created by each student on a course, their descriptiveness (i.e. how descriptive the student is when describing a new idea) as well as a detail index (the ratio of descriptiveness to number of ideas). On each student’s result page, these numbers are automatically compared to the rest of the class on the specific course to easily see whether a student is in front or behind the class norm. We hope these new features will redeem any difficulties in following-up on the progression of student’s and thereby contribute to management the courses. Additionally, due to the educational aspect of the game, a plug-in certificate has been integrated into the platform to recognise the effort and accomplishments of creativity training. Thus, after playing more than 10 hours, it will be possible to get a certificate of achievement. This certificate can be integrated into LinkedIn and is rewarded to every student that has trained more than 10 hours, regardless of being enrolled in a course or not.